I am a new DropZone user. I noticed that as long as DropZone runs in the background, it uses the discrete graphics chip of my MBP. It's one of the mid-2010 units which are notorious for that. Thanks for an otherwise great application. Darn - I was pretty sure this was fixed. How do you know it's Dropzone causing the discrete graphics to get switched on? Could it be another app? OK, thanks. Which version of Dropzone are you running? And is this the Mac App Store or non-Mac App Store version? It's version 2.8.5 Build 754, non-MAS version. Same behavior with the previous version. I'm a new Dropzone user, so the current and the last version are the only two I have used and can provide information about. OS is 10.9.1 build 13B42, my machine is a mid-2010 i5 MacBook Pro, the discrete graphics adapter is an NVIDIA GeForce GT 330M. Basically without stripping out all the Core Animation/Open GL stuff in Dropzone (which is practically impossible, the whole grid and everything is rendered with Core Animation) there's noway to fix this. With the problem now resolved on all post 2011 MacBooks there's just no incentive for me to spend time on this. Sorry! You may want to discontinue using Dropzone until you upgrade your MacBook. 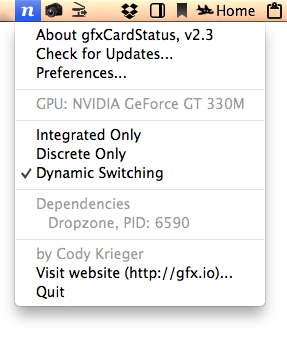 Did you try turning off grid animation in the preferences? I don't think this will fix it but worth a try. Thanks for taking the time, John. I did try turning off grid animation but, as you expected, it doesn't fix it. I understand fixing this would be too complicated to bother seeing that this affects only a relatively small user base. I will continue using Dropzone anyway, I will just disable it when the computer runs on battery.